To Purchase Scroll Sanders click here. To Contact Scroll Sanders click here. Are Easy to Use and Quickly Smooth Edges of Scroll Saw Projects! Simply Replace Your Scroll Saw Blade with a Scroll Sander Abrasive Belt, and You Can Sand Your Project to Perfection. Are Unlike Scroll Saw Files and Other Rigid-Backed Abrasive Products. 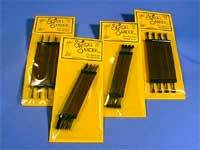 They are Flexible, Cloth-Backed Sanders that Hug the Edge of Your Scroll Sawn Projects. They Don't Flatten or Gouge the Edge of Your Wood, as Rigid-Backed Abrasives Do. A belt sander is a machine used to sand down wood and other materials for finishing purposes. It consists of an electrical motor that turns a pair of drums on which a seamless loop of sandpaper is mounted. 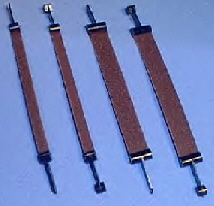 Belt sanders can be either hand-held, where the sander is moved over the material, or stationary (fixed), where the material is moved to the sanding belt. Stationary belt sanders are sometimes mounted on a work bench , in which case they are called bench sanders. Stationary belt sanders are often combined with a disc sander . Belt sanders can have a very aggressive action on wood and are normally used only for the beginning stages of the sanding process, or used to rapidly remove material. Sometimes they are also used for removing paints or finishes from wood. Fitted with fine grit sand paper, a belt sander can be used to assure a completely smooth surface.